It’s September now, and while hints of autumn may be in the air other places in the world, in Austin it’s still hot and sticky and feels like summer! It’s a good thing, too, because the Summer Sue Makeover to update Sunbonnet Sue’s Magical Friends is not quite done! Today I bring you two updated sets from the Way Back files: Fanciful Fairies and Friendly Familiars. Both sets have been completely updated, and as with the previously updated set, each individual block is now available as a stand alone pattern exclusively from Craftsy! How much do I love Sunbonnet Sue? She has her own page here on Sewhooked! Fanciful Fairies includes 6 full color patterns of sweet fairies! My personal favorite is the Tooth Fairy. She’s a busy little lady! The Tulip Fairy always makes me think of my sister. Tulips are her favorite flower! Rose Fairy reminds you to take time for the sweet things in life. Flower Fairy is bringing a smile to a friend. Everyone needs a Fairy Godmother! Daisy Fairy is a close second for my favorite. I just love how she’s perched so sweetly! Water Fairy is a bonus pattern not included with the set. When I was originally drafting these patterns several years ago for a book that ended up not being published, she was an extra that didn’t make the cut. Here she is now, in her sweet glory! If you have been around Sewhooked for any length of time, you know that I love whimsy and magic. Friendly Familiars is one of the original sets of patterns that were destined for the book-that-wasn’t. I can’t imagine a little witch or wizard worth his (or her!) salt not enjoying the company of a magical creature! I always imagined this to be a little wizard with a toad he found in the garden. He also reminds me of one of my all time favorite Harry Potter characters, Neville Longbottom! Snakes tend to be associated with evil. Bad boys need friends, too, right? The question that I ask myself about this pattern is what this Wizard is about to do. I’m voting for conjuring cheese for his rat! Owls are just magical by nature, aren’t they? This little witch is whispering secrets to her feathery friend! Cats are by far my own favorite magical creature, having had quite a few of my own over the years! There are still two sets to be updated: Busy Bodies and Wand Wielders. They’re in progress and I hope to have them to you soon! After that, I hope to have some NEW Sues to share! 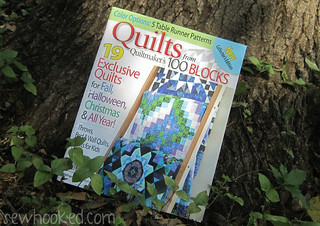 In case you missed it, I have a pattern in Quilts From Quiltmaker’s 100 Blocks, Fall 2013 – Buy it on Etsy! Reminder: ALL Sewhooked printed patterns are 1/2 price on ETSY (no coupon needed) and will be gone after September 30. As of October 1, all Sewhooked my patterns will be available exclusively as PDFs via Craftsy! Have you made any of my patterns? I’d love to see them! Share a link or better yet, add them to the Sewhooked flickr group! This entry was posted in Craftsy, paper piecing, shop, Sunbonnet Sue and tagged fairies, paper pieced patterns, summer sue makeover, sunbonnet sue, sunbonnet sue's magical friends, witches, wizards on September 5, 2013 by Jennifer Ofenstein.